We got asked that a lot when we told people that we would be spending a few days in Myanmar on our Asia trip. Armando suggested we experience Myanmar before it catches up with the rest of the world. I agreed. And I must say, it was an amazing experience. We both loved it so much and almost wished we had slotted more time there. 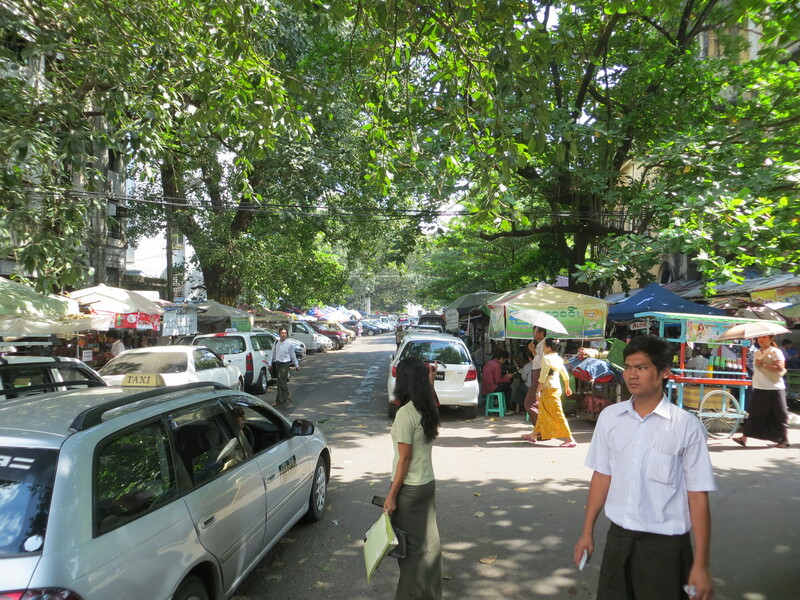 Our first stop was in Yangon which was once the capital of Myanmar but is still the largest city and commercial hub of the country. I have so many stories and memories of this place but instead of boring you with a novel of my time there, I will share a few highlights. I fell in love with the people there. They were so kind, generous and genuine. There were many opportunities where they could have easily taken advantage of us but it was truly not in their nature. Their selflessness was so inspiring. 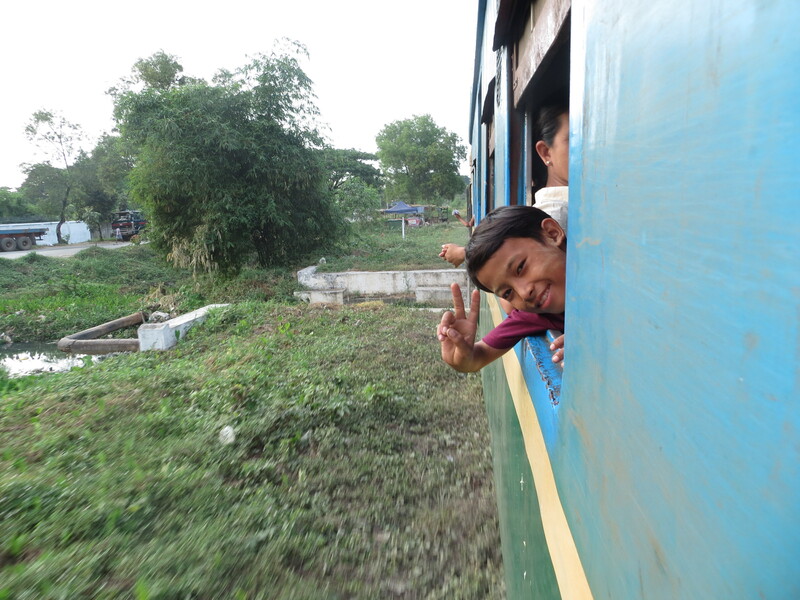 This was on a 3-hour train ride on a commuter train around the city that we took with the locals. This little boy tried to buy me a bag of oranges. He was so sweet! Just one of the many wonderful people we encountered. Hotels are overpriced because of the increase in tourism and lack of accommodation space. 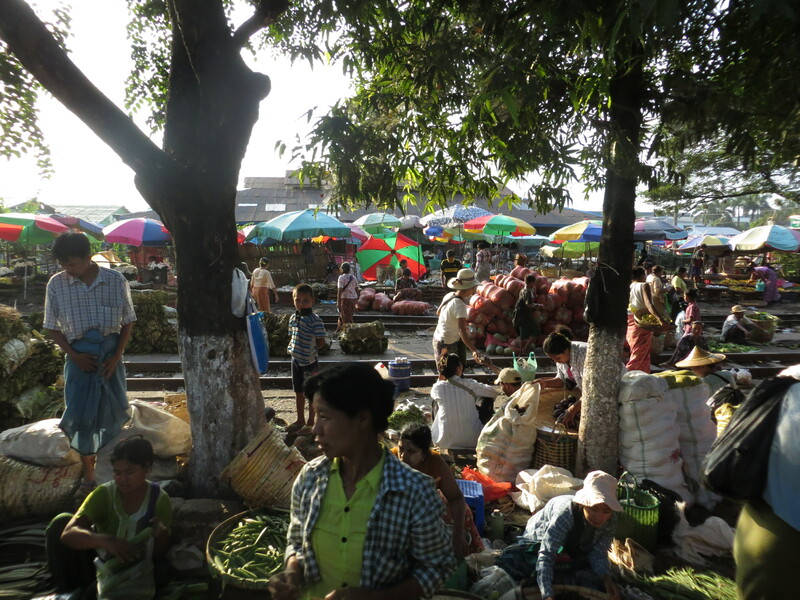 Myanmar was not a place where travellers came to in the last few decades. Our hotel room was clean but smelled like mothballs. The cheap food and drinks more than made up for the overpriced rooms. For dinner with bottled water and beer for the two of us, it would be an average of $7.00 total! I loved, loved, loved the fried rice there. 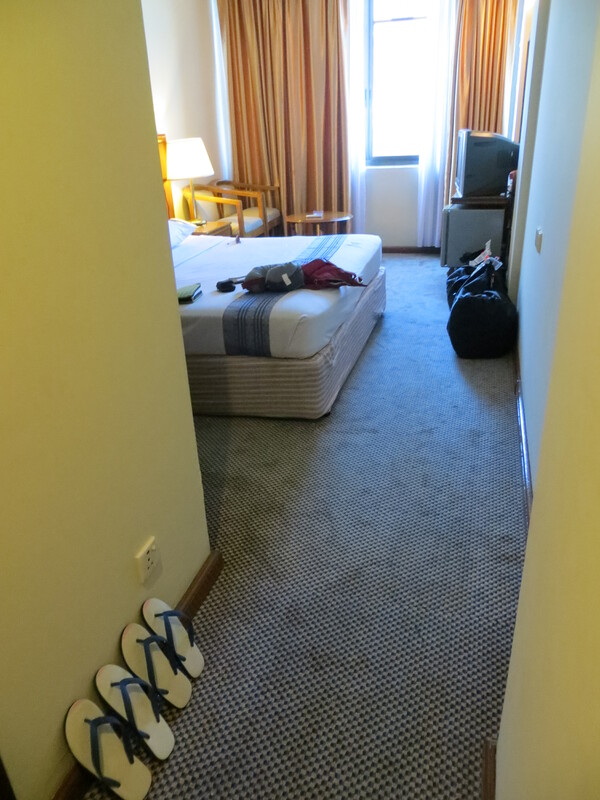 This was our hotel room at the Panorama Hotel in Yangon, Myanmar. Notice the flip-flops propped up on the side of the wall? Before our trip was up, I learned why they were propped up on the side of the wall…because if they are not, cockroaches and other large bugs will hide underneath them. I learned that the hard way. 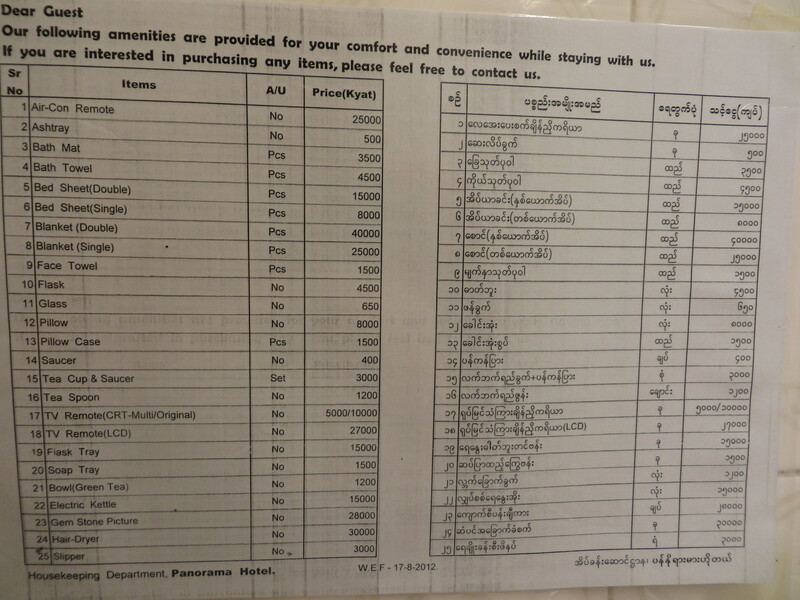 Everything is for sale at the Panorama Hotel in Yangon, Myanmar. This was a sign posted in our hotel room. 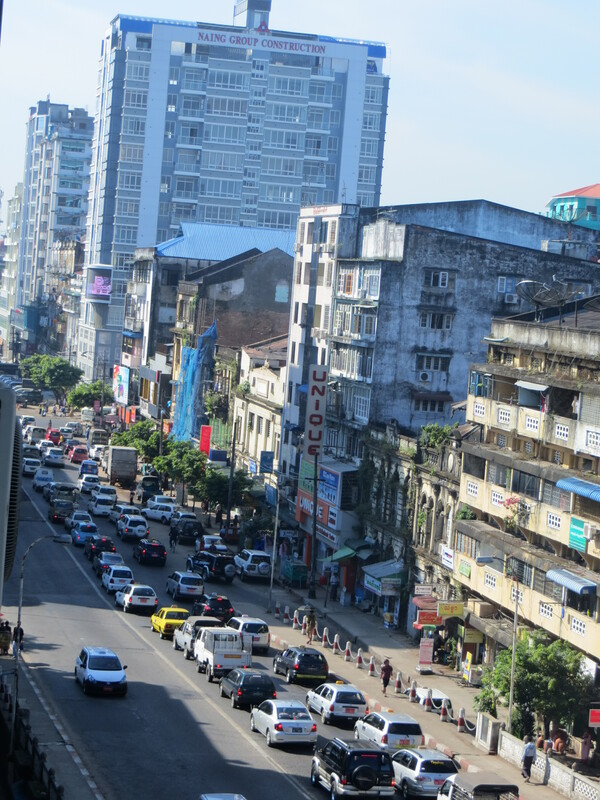 The view from our hotel room in Yangon, Myanmar. 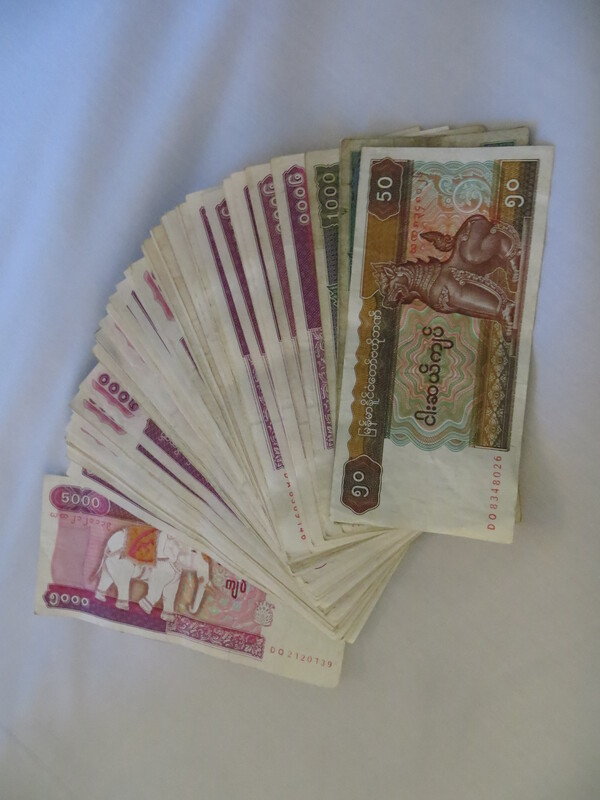 A stack of Kyats, Myanmar’s local currency. Knowing that everyone walks around with cash and not credit cards was a little unnerving at first. Wouldn’t this be the perfect grounds for pickpockets? Apparently not, what with strict punishments and the nature of Buddhists that populate most of the country. The Buddhist religion was very prominent. Monks were everywhere. It was really nice. Something about the Buddhist religion that just gives off a sense of peace and happiness. 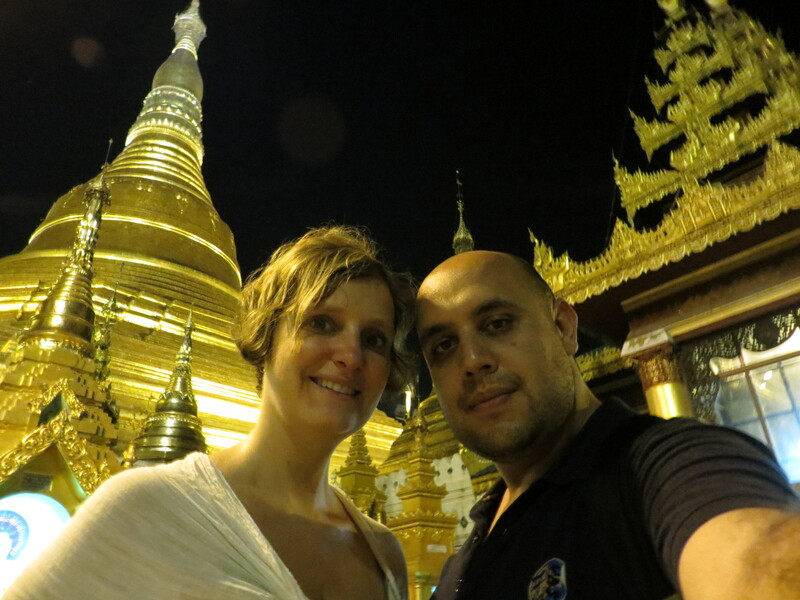 We were lucky to experience the Shewedagon Pagoda, the most important pagoda in Myanmar. It was so impressive! And I loved how the monks seemed to take a liking to Armando. I think it’s because he has a resemblance to the Laughing Buddha! The amazing Shwedagon Pagoda in Yangon, Myanmar. It was an eye-opener to experience a world without modern technologies again. It’s interesting how quickly we forget how life was like before debit cards, smartphones and to-go coffee cups. Remember companies had to have their logo on a rubber stamp to make their own letterhead? Well, maybe you don’t but there was a time where that existed and it still does in Myanmar. It was truly an unforgettable experience. Can you see the men sitting on tiny, plastic stools? The were conducting business meetings there. We had to book flights with a local Myanmar travel agent before our trip. In fact, we had to book our accommodations with her too because there was a realistic concern that there would be no hotel rooms available if we just showed up without a reservation. Again, supply and demand problems. The domestic flights fly out of the old terminal at the Yangon International Airport. There are guys with pens and paper, filling out old school carbon copy tickets and manual manifest sheets. Once checked in, you are given a coloured sticker to wear. The colour determines which flight you are on. There are no signs or electronic departure/arrival boards to keep you in the loop. The only reassurance you have that your flight has not left without you is by walking around to make sure there are others still there with the same coloured sticker as you. 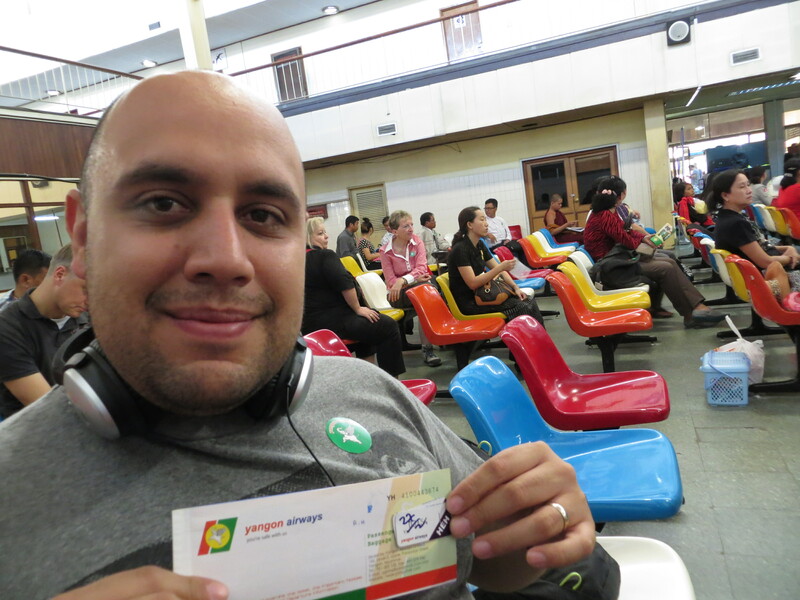 Armando with his paper ticket and boarding pass sticker at Yangon International Airport. This was in the old terminal to catch a domestic flight to Heho, Myanmar and then a one hour drive to our next destination.